BackyardCityPools.com offers a complete line of replacement motor seals for pumps made by all major manufacturers such as Hayward, Sta-rite, PacFab, Pentair, and Jacuzzi. These motor seals are offered at discount. The motor seal MUST be replaced along with the motor, because installing a replacement motor with an old pump can cause the pump to leak which can lead to a variety of problems. 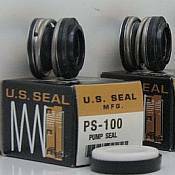 The PS100 seal is the repacement seal for Sta-rite Dura-Glas pumps..